The grade of plywood utilized is critical to the performance of the waterproofing. The use of marine-grade plywood or “water-resistant Structaboard” as a substrate for the Derbigum membrane is essential. The surface of the timber substrate must be smooth. Holes should be plugged or covered. Knot holes are not acceptable for waterproofing purposes. Timber panel edges should bear on joists or blocking to reduce deflection from traffic. The boards should not be close butted - allow open joints (a few millimetres) between panels/boards so as to accommodate anticipated expansion. (as per the Board manufacturer's instructions). The thickness and deflection characteristics of timber substrates are important design considerations. Timber decks should be sloped for drainage. Fillets are to be fixed at all abutments. Fillets should have a minimum face of 50mm and be securely fixed in the angle on one plane. 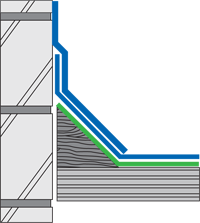 Mechanically fasten Derbigum CG2 or Interdek underlay with selected clout nails and 38mm diameter roofing washers at 300 centres and one layer Derbigum SP4, with 75mm side laps and 100mm end laps, sealed to underlay by “torch-fusion”, finished with Roofcote bituminous aluminum paint or high quality acrylic paint to spec. Waterproofing of roofs to be installed by an Approved Derbigum Contractor under a ten year guarantee.